These dreams can also become sexualized (which is why the term "autogynephilia" came up in the first place, meaning "love of oneself as a woman"). Indeed many transwomen admit that they have had such dreams, but that they disappear after transitioning. 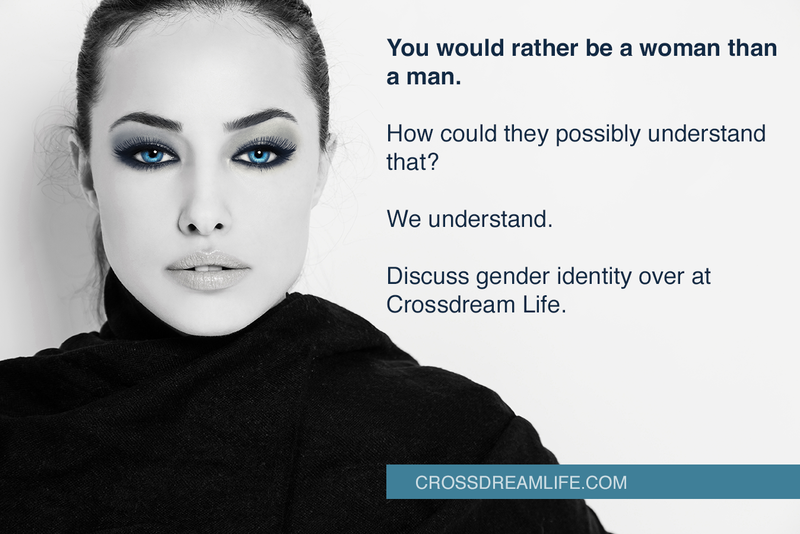 My guess is that as they can explore their sexuality as a woman in real life, the crossdreams lose their emotional energy. That fear of being caught watching a movie like that says a lot about the guilt we get from crossdreaming fantasies. The truth is that these were pretty "normal" movies watched by "regular" people, and no one would have suspected anything if you had been caught watching them. I can also remember watching "Switch" with great fascination. It made my own dreams tangible, so to speak. But it also made the pain and sorrow more present. Among other gender bender movies, we find the recent romantic comedy It's a Boy Girl Thing. There is an Indian version of Switch! As for other non-pornographic gender bender movies, Zerophilia seems to have been made by a crossdreamer. The same applies to Identity Theft. There is also a recent controversial horror film exploring the theme. Pedro Almodovar's latest movie is apparently another take on the same topic. Take also a look at Mako's Video Blog over at YouTube. He (at times she) covers the gender change movie and TV scene quite thoroughly.